This is the best of both worlds. The new OTA.py script is cross platform and independent of the windows app, just needs to be invoked with the right parameters (run `python OTA.py -h` for details). Those on windows can just use the desktop app (runs the protocol in native C# code), or can click the “Run OTA.py” checkbox to instead invoke the OTA.py script dynamically. The parameters are passed from the desktop app into OTA.py and the desktop app conveniently remembers your programming parameters next time you open it. Most significantly the WirelessProgramming.exe is now 3.8MB (vs 29KB) because it bundles all the required self contained IronPython runtime to run the OTA.py script. It also requires the pythonLibs.zip file that was added in the same directory. Give this free tool a try and let me know if there are any issues or bugs. Enjoy! Wireless Programming just got 50% faster! That’s an average 58% speed gain, not too bad! By comparison, the same sketch uploaded directly via FTDI/serial takes about 13s, so much closer to that figure than before. I think a few other techniques could be used to squeeze yet more speed (increasing RF bitrate!) but that’s for another day. Note that the same exact data is transferred, except in fewer longer packets. 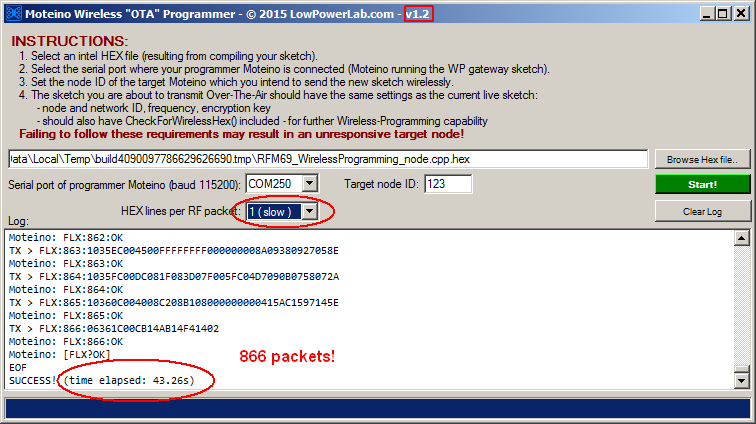 I had to make some changes to the WirelessHEX69 library to support these longer packets. Also I fixed some bugs that emerged during this development, see the github commit for all the changes. 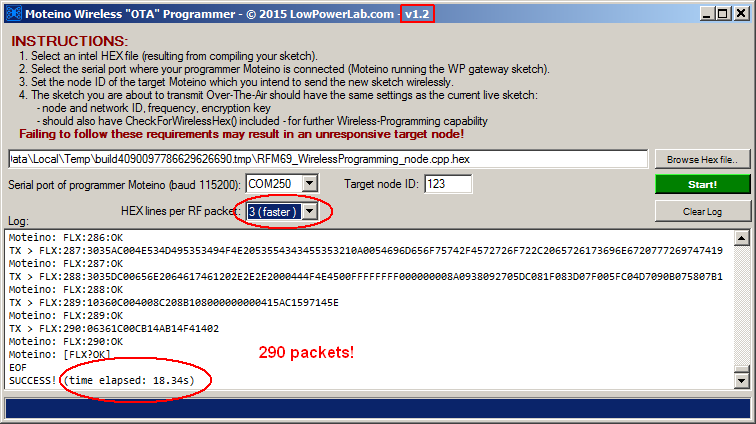 To support the new GUI v1.2 speed increase you only need to update your WP programmer Moteino with a new version of the WirelessProgramming_gateway sketch (to refresh the WirelessHEX69 code) to make it support the faster WP speed (ie also update the WirelessHEX69 lib!). Everything else is completely backwards compatible, and you can use the new GUI v1.2 with an older WP programmer Moteino if need be (1 line per packet only), and also all old target nodes that are OTA/WP programmable are not affected at all and can be updated at the new speed. FWIW you can actually use 1 or 2 (not sure why you would) or 3 lines per packet (the new default going forward). Experiment and see what your own speed gains are! Please report any bugs or issues in this forum! I will potentially expand this to allow remote wireless programming through a tcp port, just like the 3rd party vb6 app, but I doubt that will be very popular so I am sticking to the basics for now. If there are any bugs let me know. This is it for 2015, see you on the other side of 2016! Following the MoteinoMEGA release, the RFM69 library and examples have been updated to support MoteinoMEGA, there are significant changes to the library and you should get latest. The MoteinoMEGA Arduino Core has been released and needs to be installed in the Arduino/hardware folder (stable v1.0.5 tested working) before uploading to MoteinoMega. The Eagle source and schematic/board files are published in the LowPowerLab github repository. The Moteino page was updated to reflect the addition of the MEGA to the Moteino family. The Wireless Programming library and examples are updated to fix bugs and support the MEGA as well. Another important change is the introduction of radio.ACKRequested() function in the RFM69 lib which should be used instead of the radio.ACK_REQUESTED variable. This ensures that ACKs requested by a broadcaster are ignored and only targeted ACKs are responded to. Please update your examples for proper wireless programming behavior. All examples have been updated to reflect this change. Also the SwitchMote sketch has been updated. I consider this a major release and hence your constructive feedback and notification about anything that was omitted is appreciated. I’m close to being done coding the SwitchMote, I think the code will be released tomorrow. I’ve been testing the code on the SwitchMote here in the lab because I can physically interact with the buttons on it. Needless to say, every time I want to upload the new firmware I cannot disconnect the breaker, unscrew the wall plate and the mains wiring, detach the unit from the wall to be able to upload through FTDI, that would be awful. Enter wireless, over the air, magic, programming of Moteinos. I’ll just say that it comes in very handy when your project is in the wall! One note to mention is that I’ve recently patched the wireless programming library to shift frequency up by 8Mhz during upload so the heavy RF traffic would interfere less with the rest of the network packets. Also I added an option to use another LED to be flashed during upload – handy for SwitchMote which has a bunch of LEDs on the front panel which are all on other pins than the default D9. I’m also planning to experiment with increasing the bitrate during the upload, maybe double it, and see how much faster and reliable that is. But that might prove tricky since several other settings depend on that, so all settings have to be changed back to what they were after the upload is complete. I put together a quick video to show the progress of SwitchMote and a simple demonstration of how it works and how it can be used in home automation. My goal is to offer a smart wireless light switch controller that allows syncronization with other units independently (without the need of a gateway/coordinator) to create light scenes, and increase the usability of a regular light switch. Some users have reported having trouble with wireless programming so I have made some changes to the Wireless Programming libraries and the examples included in the RFM12B lib examples and the RFM69 lib examples. They are mostly tweaks, bug fixes and simplifications of the sample code. Hopefully things will be smoother now. As always, please let me know if the libs are not performing and I will do my best to patch the code and fix the bugs. The last few weeks I have spent a lot of time tweaking the RFM69 library and trying to get the wireless programming to work. I believe the RFM69 library is now more stable and ready for some prime time and also the wireless programming is working nicely for Moteino R3. If you think about it, being able to reprogram a mote that is 200m away, or somewhere in a tree, underground, in your attic, or on the bottom of your pool, is a pretty cool thing. If you have a Moteino R3 (or R2) with the onboard FLASH chip, you are ready to try programming it wirelessly, go ahead, it’s pretty neat. The examples for Moteino R2 and R3 are in the directories for their libraries: RFM12B and RFM69. More great stuff is coming, I got a lot of ideas for Moteino R3, I am thinking of migrating my home wireless sensor network to R3 and implementing a lot more home automation on these. Today I worked on improving the protocol and was able to cut down the over-the-air upload time by a factor of ~5. The gains are mostly from improved serial communication. This will still take about twice as long as normal sketch uploads by means of an FTDI adapter. For instance, a 9,8Kbyte sketch takes me about 11 seconds to upload directly to a Moteino using an FTDI cable; wirelessly programming that same sketch takes about 22 seconds. Not bad given how involved the whole handshaking protocol works. And much better than almost 1 minute with the old code. So I’m classifying this new release as a beta. More improvements or bug fixes might be added later, but it’s definitely a functional release. I’ve uploaded different sketches of around 10KB several times without a glitch. The wireless sketches examples (gateway and node) and the python script are in their github repo. The SPIFlash library was also updated (the WirelessHEX part of it), so get latest before you try this. As mentioned before, the target node of the wireless programming protocol will need to have an SPI Flash chip attached (if they don’t have one already), and also run the DualOptiboot bootloader for this to work. Moteinos come with this bootloader (all orders since the other Wireless Programming post and code was released). If you have all these components right, any Arduino clone with an RFM12B transceiver and an SPI Flash chip of at least 32Kbytes of memory will do the job.